There is a chill in the air and this weekend I had to turned on the heat in my home. November starts the season of comfort foods. My number one favorite comfort food has always been chicken pot pie! Nothing better then moist chicken and fresh vegetables swimming in creamy buttery sauce, topped with a flaky pastry crust. Every bite melts in your mouth, but after I always feel a little bit guilty because most pot pies are full of fat and salt. 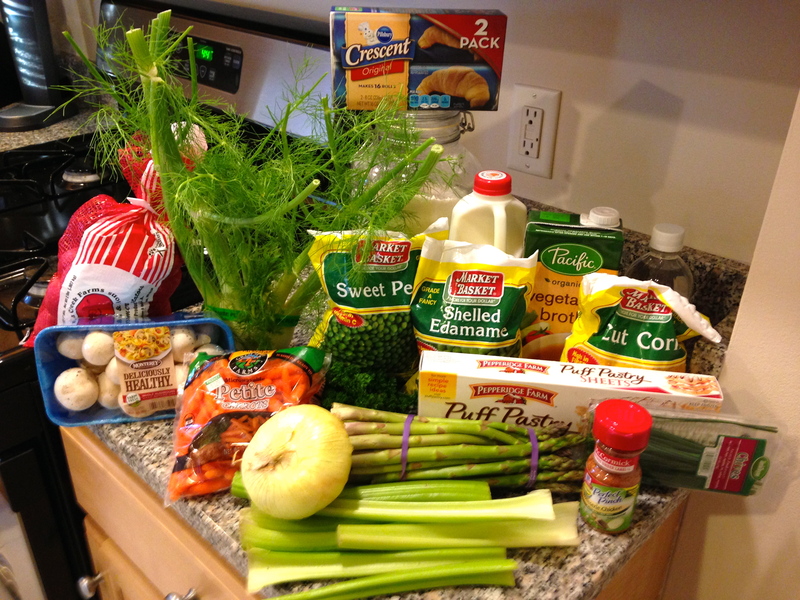 For example here is a standard individual pot pie you would find in most grocery stores. The serving size is 2, but most of us would eat the whole” individual” pie . 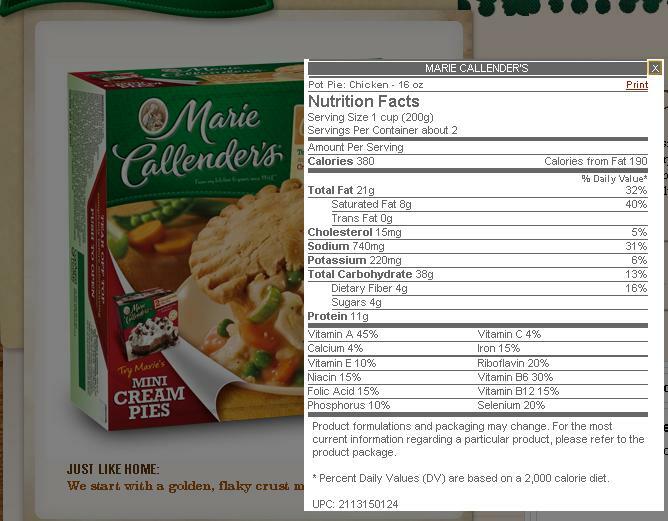 The pie has 760 calories, 42 grams of fat and 1480 mg sodium! Wowza, that’s a lot of fat and salt, no wonder I love it! 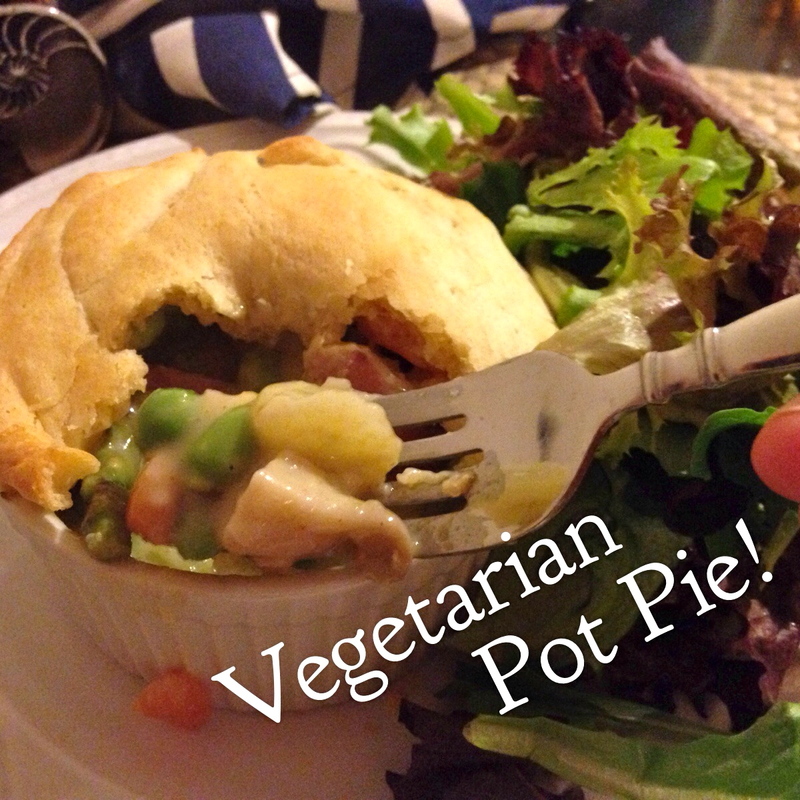 In my pintrest pursuit of recipes I came across a few vegetarian pot pie recipes that inspired me in the kitchen as I continue to include more and more vegetarian meals in my week and participate in Meatless Monday. Meatless Monday is a international movement to help people reduce their meat consumption by 15% to improve personal health and the health of the planet. I love this because they are not asking you to give meat up completely but to reduce, which is very realistic. Going meatless once a week can reduce your risk of chronic preventable conditions like cancer, cardiovascular disease, diabetes and obesity. It can also help limit your carbon footprint and save precious resources like fresh water and fossil fuel. 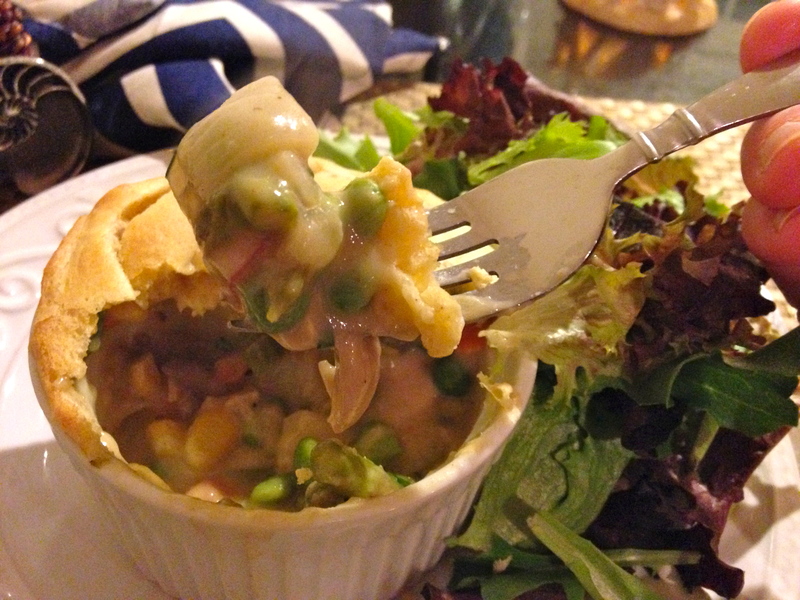 I love this Veggie Pot Pie recipe because you still get all that chicken pot pie flavor and protein without adding any chicken. The protein comes from edamame aka soy beans, a 1/2 cup has about 12 g protein and 4g fiber. Available fresh or frozen, edamame can be boiled whole, then shelled and eaten as a snack or added to stir fries, soups, salads or pot pies! The mushrooms and potatoes give the pot pie that meaty texture as well. Finally the key to the creamy texture is adding that 2 Tbps all purpose flour. This creates a roux, which is a french word for thickening by cooking a flour and oil until the raw flavor of the flour cooks out. I have to say this has been one of my favorite creations. To be able to eat what feels like a decadent comfort food but walk away from the table knowing we cut the calories, fat and salt, feels amazing! 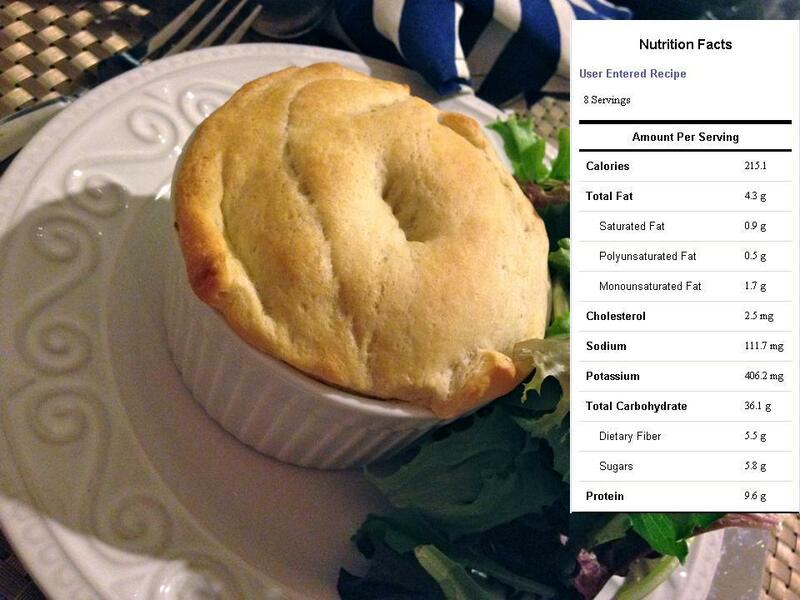 This recipe compared to the standard pot pie (above), we save (per 8 oz servings) 165 calories, 17 grams of fat, and 629 mg sodium. It shows that when we cut back on meat, we cut back on calories and fat, but that doesn’t necessarily mean flavor. My Challenge for you this week it to consider taking the Meatless Monday challenge and included one day per week of vegetarian meals! 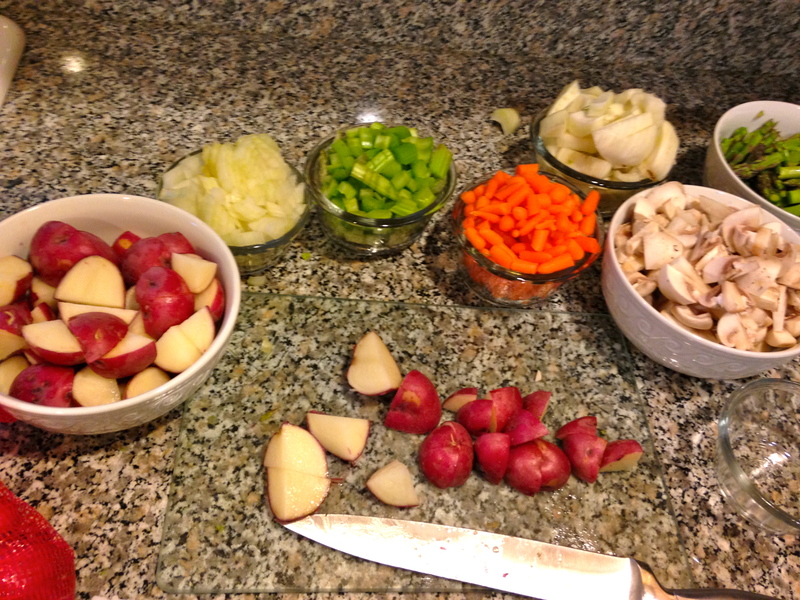 Step 1: Chop and prep your vegetables: onion, celery, fennel, carrots, mushrooms, potatoes and asparagus. 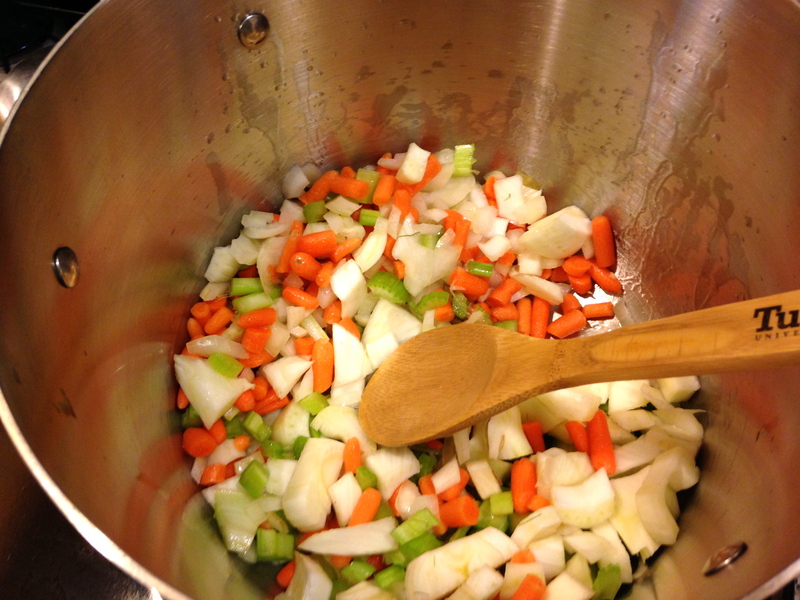 Step 2: In a Dutch oven or heavy bottomed saucepan add olive oil and on a high heat add: onion, celery, carrots, and fennel. Cook for about 3 minutes until soften and onions are translucent. 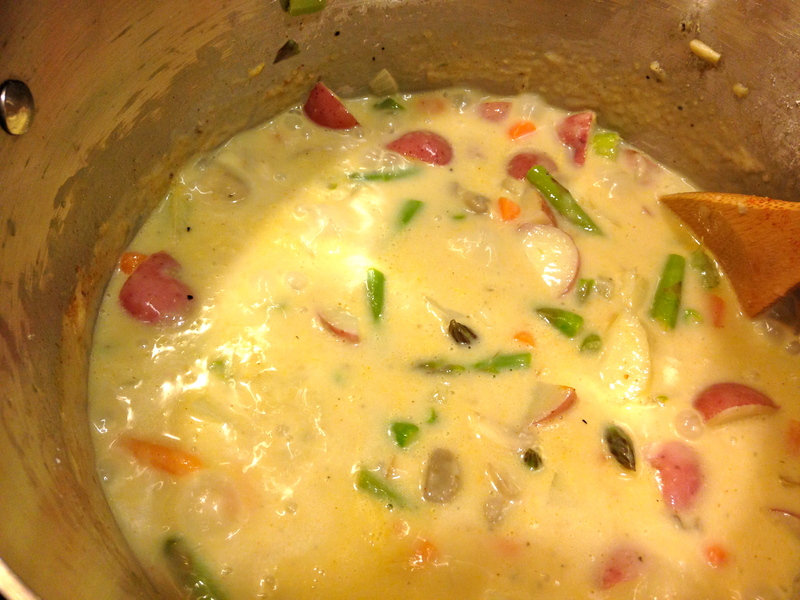 Step 3: Add potatoes, asparagus and mushrooms. Cook, stirring rarely, until mushrooms have let off water and are shrunken, about 6 minutes. Season lightly with salt and pepper. 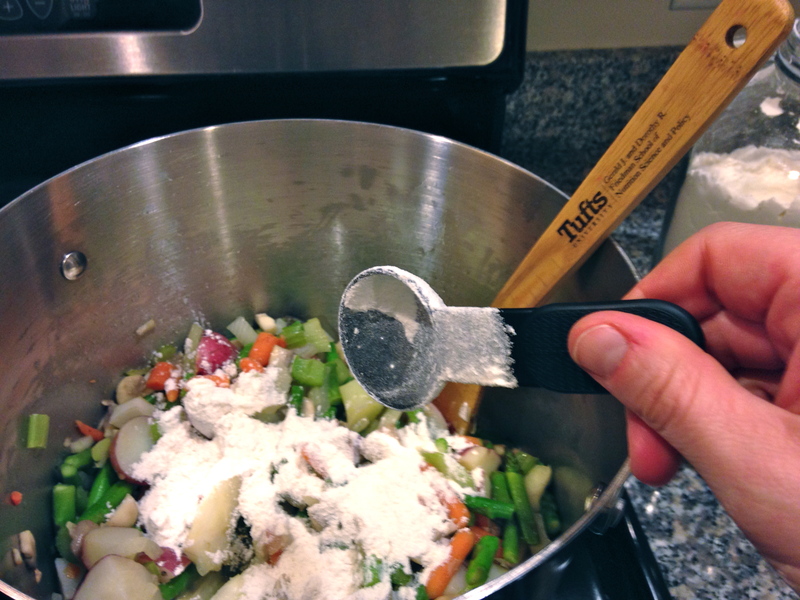 Step 4: Sprinkle flour over vegetables, stir to coat, and cook until raw flavor is gone, about 1 to 2 minutes. Step 5: Add broth and milk. Stirring until mixture is smooth. 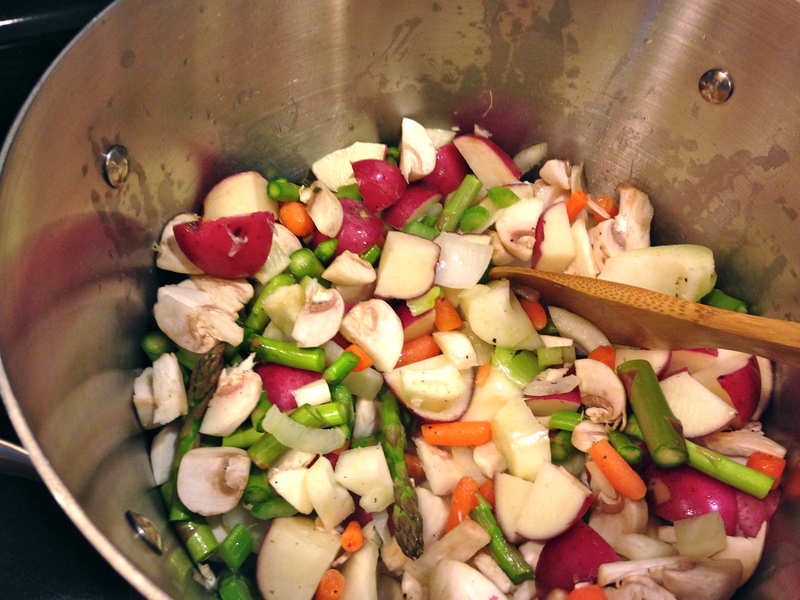 Bring to a simmer over medium heat and cook until slightly thickened, about 5 minutes. Step 6: Once thickened add poultry seasoning, edamame, peas, corn. 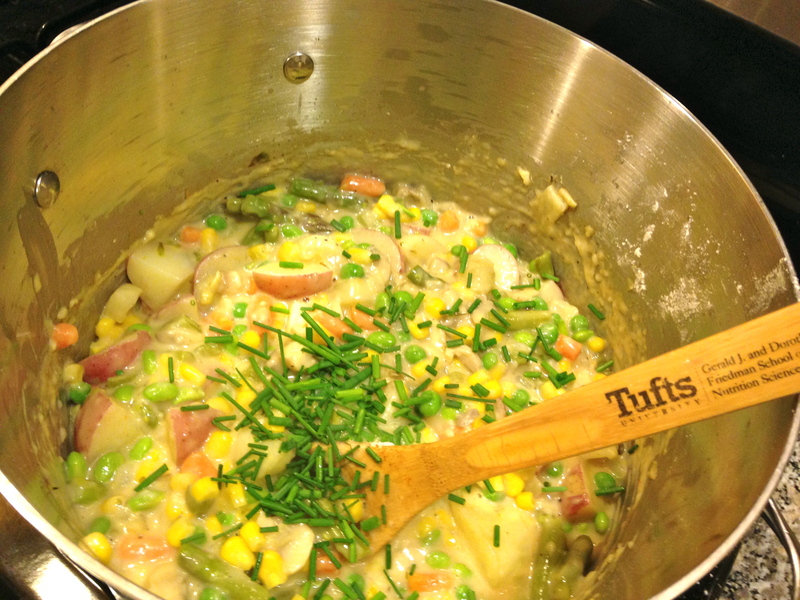 Take off heat and add chive and parsley. Step 7: Place filling in 8, 8oz ramekins or 8 by 8-inch baking dish. Using puff pastry or crescent roll dough cut dough to fit over the baking dishes. Place dough over filling and tuck into the edges of the dish. Step 8: Place on cookie/baking sheet. Place in the over at 375 for 10-15 minutes. Until pastry is golden brown. Enjoy! This entry was posted in Meatless Mondays!, Quick & Healthy, Uncategorized and tagged Comfort food, High Fiber, Homemade, Meatless Monday, Protein, vegetables, Vegetarian, weight health, Weight loss. Bookmark the permalink. 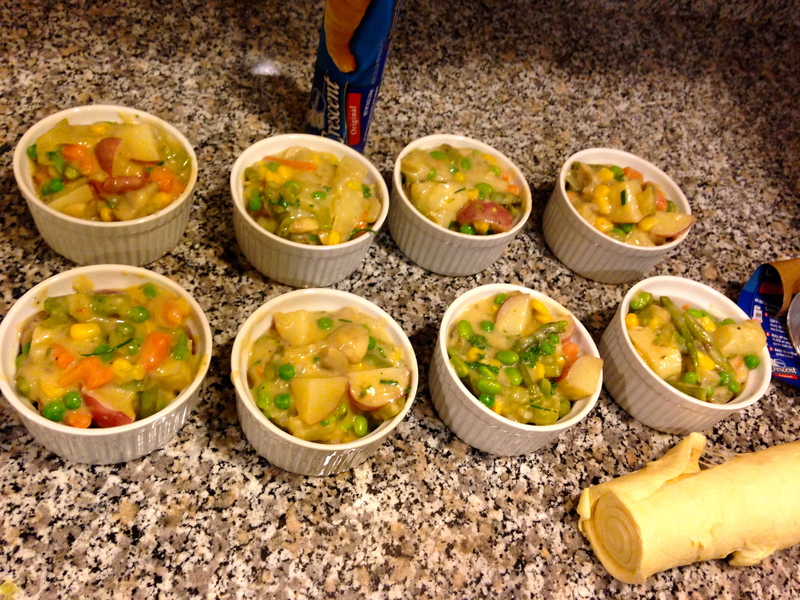 1 Response to Quick & Healthy… Veggie Pot Pie!